Pioneer brand A-Series soybean growers set a new Pioneer record for 100 bu/A yields in 2018. The elusive 100-bushel yield ceiling was broken more than 50 times in on-farm trials across the United States. The previous record was set in 2016 when 15 Pioneer brand varieties broke the 100-bushel mark in on-farm plots. "The investments we have been making in soybean R&D are helping more growers than ever break the 100-bushel bean mark," said Judd O'Connor, President, U.S. Commercial Business, Corteva Agriscience, Agriculture Division of DowDuPont. "No matter the location, growing environment or maturity, A-Series soybeans are helping soybean growers across the country consistently improve their yield and profit potential, even with the challenging weather conditions growers experienced this season." "A-Series soybeans are the direct result of our increased investments in research, development and testing starting in 2011," said Dr. Paul Stephens, Pioneer Senior Research Director, Soybeans. "The investments we have been making in local research and testing, Accelerated Yield Technology or AYT 4.0 and advanced molecular breeding are delivering higher yielding varieties that are bred, tested and proven in the environments where they are grown." 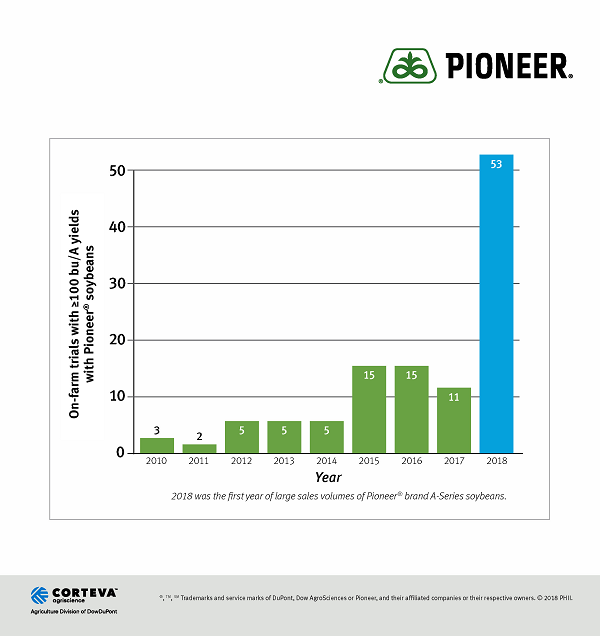 Pioneer's A-Series breeding efforts are deployed across all of its soybean herbicide-tolerant trait platforms to deliver soybean growers top-performing varieties. Boasting a 1.8 bu/A yield advantage vs. competitive varieties with Roundup Ready 2 Xtend (RR2X) technology, Pioneer brand A-Series soybeans with RR2X technology had 62 percent wins in more than 5,000 on-farm comparisons. A-Series varieties with the LibertyLink gene outyielded competitive LibertyLink varieties by 5.9 bu/A in 300 comparisons, winning 79 percent of the time. "Pioneer is the clear leader in developing new, improved LibertyLink varieties," Stephens said. "Our A-Series varieties with the LibertyLink gene are a great example of the benefits of AYT 4.0 and our intense focus on local breeding and development. The 2018 LibertyLink yield advantage in A-Series soybeans would equate to about a $50/acre advantage against the competition this year." LumiGEN system seed treatment - including DuPont Lumisena fungicide seed treatment, the most advanced seed applied technology to control Phytophthora since the introduction of metalaxyl - protect and help enhance the performance of Pioneer brand soybeans. Soybeans treated with Lumisena fungicide seed treatment have a 1.0 bu/A overall yield advantage and a 4.0 bu/A yield advantage in areas of heavy Phytophthora pressure. "Pioneer is bringing a broader line-up of products to the market much faster, while delivering greater yield potential backed by strong agronomics to famers," O'Connor said. "With the thousands of on-farm trials we conduct every year, our customers can rest assured that they will have seed products with the latest innovations that are proven to deliver outstanding results, so more of them can pass the 100-bu/A yield barrier each season."